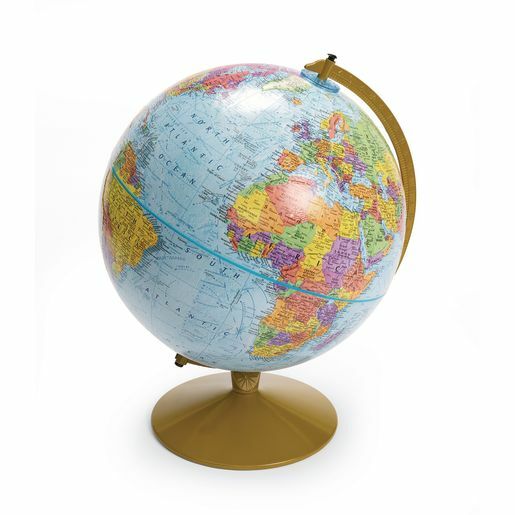 Political Globe on Stand - 12"Dia. A must-have basic teaching tool! SOC (K) Understands the theme of people, places, and environments involves the study of location, place, and the interactions of people with their surroundings. SOC (K) Understands the study of the past in the story of communities, nations, and the world. SOC (2) Understands cultural patterns and their interactions within and across places, such as migration and settlement, changes in customs or ideas, and in the ways people make a living. SOC (3) Understands that tools such as maps, globes, and geospatial technologies in investigating the relationships among people, places, and environments.